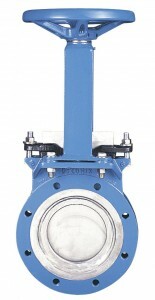 DeZURIK Stainless Steel Lined Knife Gate Valves are designed for on-off and isolation of corrosive, abrasive and viscous liquids; abrasive slurries, pulp stock, and dry materials. Stainless Steel Lined Knife Gate Valves valves feature stainless steel wetted parts, raised face seat for positive sealing, welded-in gate guides and jams, and high flow capacity. Conforms to TAPPI Standard TIS 405-8. Seat options include metal and resilient seated, plus a v-orifice design for throttling control.